The purpose of this site is to provide information to residents and the general public about Jackson Tower. The site will always have a current list of units for sale and rent, and sellers can upload a complete photo album of their unit. For questions or comments please contact Jackson Tower resident, real estate sales agent, and web site maintainer Tom Friedel. Tom Friedel is a INACTIVE real estate sales agent and original resident of Jackson Tower. 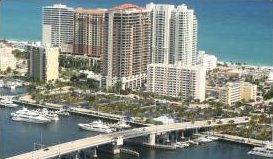 Tom has lived in Fort Lauderdale for seventeen years, and twelve in beachfront condominiums. Contact Tom at email.